Check out this graduation slideshow! Remember the special moments from high school with graduation slideshow ideas. Learn how to create a slideshow that will impress your classmates and touch everyone's heart. The two most important parts of a slideshow are the pictures and the music. When creating a graduation slideshow, choose pictures that everyone will find interesting, memorable, and/or funny. This means that you will have to ask your classmates for any pictures they would like to contribute. If you receive too many, you can always get a group together and vote on the best ones. 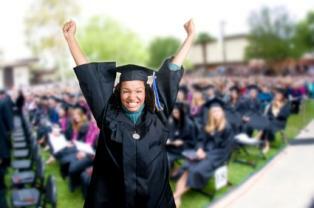 PowerPoint is a powerful presentation tool that you can use to create a graduation slideshow. Before you start, scan all the pictures you want to include in the slideshow onto your computer and store them in a folder on your desktop. If you have pictures from a digital camera, resize them so they aren't so big. The other thing you want to do before starting with PowerPoint is choose the music you want to use and acquire the digital music file. Save the file on your desktop. Now that you have everything organized and ready to go, open PowerPoint. Click on "Open a New Slide Show." The program will ask you to type a title into the title slide. You can simply type in the word Graduation and then the year, or your classes' graduation motto. Once you've chosen the title, click "Create a New Slide." At this point, you will need to decide if you want to have text on each photo slide or just have the picture. Then count how many pictures you are going to use in the slideshow and click the "Edit" menu and select "Duplicate Slide." Repeat this step for as many pictures you have. For the last slide click the "Insert" menu, then select "New Slide." Next click the "Format" menu and select "Slide Layout." This will allow you to choose a different layout for the last slide so you can type in credits, best wishes, or simply, "The End". You can change the format of any slide in your slideshow this way. To add a picture to each slide, click on the slide and browse to your picture folder on your desktop. Once you have your photo on the slide, you will be able to edit it with PowerPoint editing features. To add music click the "Insert" menu, select "Movies and Sounds," and then "Sounds from File." Choose the digital music file you want to use and click the "Insert" button. Finally, choose "Yes" when it asks if you want the file to play automatically. If you are still unsure which graduation slideshow ideas to use, consult with someone who is experienced in creating graduation slideshows. You can either contact a videographer in your area or search the Internet for one. A videographer can take the pictures you have, make suggestions on how the slideshow should look like, and help you choose the best music for it. Once you have the slideshow created, you may want to make some copies. If you used a videographer, consider selling copies of your slideshow to help cover the cost of the service. You can also ask your school if they would be willing to pay for the cost of having the copies made and pass them out as graduation gifts. A graduation slideshow is a memento that will be treasured for a lifetime.